KEMPTVILLE — A plume of steam rises above Kemptville’s Agroforestry Educational Centre, a sure-fire indicator the formerly idled maple facility is back in operation and welcoming the public after four years in mothballs. Standing inside the modern building erected by the former Kemptville College in 1993, Frank Heerkens holds a small tumbler of fresh syrup up to the light and compares it with previously graded samples. It was just last year that Heerkens revived the defunct college sugarbush, re-establishing and repairing a network of deteriorating vacuum tubes unused since the University of Guelph shut down the Kemptville Campus. 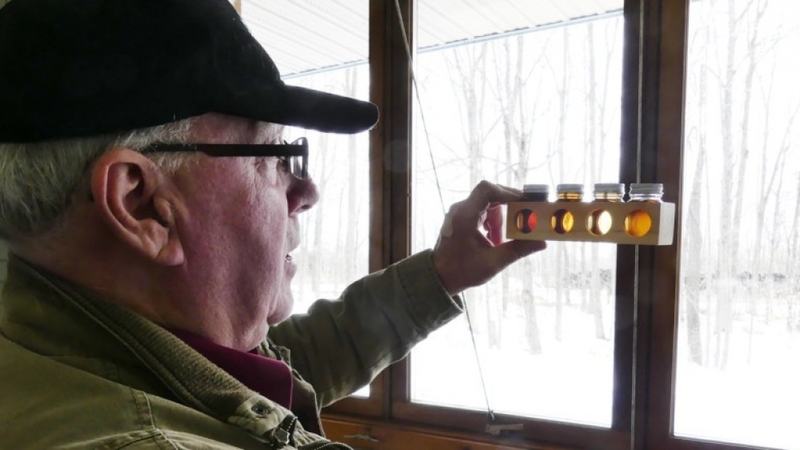 At the time, the Ontario Maple Syrup Producers’ Association vice president trucked the sap 50 km east for processing at On the Bend Sugar Shack, his own operation just outside Chesterville. This year, the ongoing agreement with the U of G has seen Heerkens and his helpers recently reopen and restart the state-of-the-art, oil-fired boiler at the Bedell Rd. Agroforestry Centre itself — a milestone that has the Dundas Power Line Ltd owner brimming with pride. “Hopefully, the people of Kemptville and area will stop in over the next little while to see the Agroforest Centre put back into production, walk the forest and see the restoration,” he says, minutes after selling the very first gallon of syrup to passersby who happened to notice the renewed activity in the building. Nine-hundred and fifty vacuum taps are installed in the Kemptville bush this season. “The sap is pouring in,” observes Heerkens, estimating that 75 percent of the average crop had flowed into Eastern Ontario sugar shacks by last week — with potentially much more of the season yet to go. While sap flows have been high, sugar content is down somewhat this season — thanks to the wet and cloudy summer of 2017 — which may work out to an average syrup production year overall if trends continue. The Agroforestry Centre was once a popular pancake spot during the annual Kemptville College Royal. In addition to being a research station and partner in the Eastern Ontario Model Forest program, Wensink also recalls the place hosting local elementary schools — the bush features a number of informative plaques aimed at primary students— as well as a regularly scheduled adult daycare program. Young and old alike also visited the place to see a replica of the wells deployed in 16 developing countries by Ryan’s Well Foundation — founded by Kemptville native and local hero Ryan Hreljac as a schoolboy. Heerkens has personally cleaned up that area, located behind the Centre. The operators await the public, about one kilometre west of County Rd. 44, at 2627 Bedell Rd. If the gates are open, they’re inside and welcome your visit.